Manuel Zumbado (1964) is a Costa Rican painter and video installer. 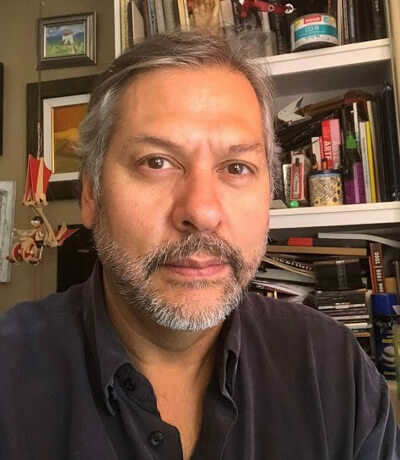 He is a graduate in Plastic Arts, University of Costa Rica; has been a fellow of the Goethe Institute of Germany; a professor of Art at the University of Costa Rica at the School of Fine Arts, Architecture and the Veritas University; and a PhD in Pedagogical Mediation from La Salle University. He has been invited twice to the Biennial of Havana-Cuba. In 2001 he won the BIENARTE CR. In 1993 1st Place National Painting Salon Museum of Costa Rican Art, 1993 Aquileo J. Echeverría National Prize in Painting. He is considered a pioneer in the area of ​​video installation and has made several international and national exhibitions. Selected Public Collections: Museum of Latin American Art, MOLAA, the city of Los Angeles, U.S.A., The Museum of Arts of New Mexico, U.S.A., Museum of Modern Art of the Dominican Republic, Fine Arts Museum, Taipei, Taiwan. And nationally, The Bank of C.R., Costa Rican Social Security Fund, C.C.S.S., Central Bank Museums, University of Costa Rica, Contemporary Art and Design Museum, Costa Rican Art Museum, CR.